Click and Collect for eBay Sellers – Useless Gimmick or Terrific New Selling Channel? What am I talking about? eBay’s new delivery service, Click and Collect at Argos. But what is click and collect and how does it work? Well, as the name suggests, it’s a simple process where your buyer purchases an item from you but instead of it being shipped to their home address, they instead collect it from their nearest Argos store. Now initially this sounds terrific! This way, the buyer chooses to collect their item and is notified when it’s ready, then all they have to do is pick it up like a normal order from Argos, on their own time. Incredibly simple and that’s why these click and collect services have always been so popular with consumers (just take a look at John Lewis, Currys/PC World, Tesco or even Argos itself). BUT there is one big difference between what say, John Lewis, offer and the click and collect service with eBay and that is SHIPPING! As you are obviously unable to store your actual products at Argos, you still need to ship them out as normal (except delivering to Argos rather than your customer directly) and once they’ve been received and processed, your buyer will then be notified that their item is available for collection. So what that means is; using this click and collect service will take as long (if not longer including processing) than delivering directly to your customer. Here at Argos, we understand the need to instantly purchase a much-needed or sought-after product. Luckily our handy Check & Reserve service allows you to do just that. Simply click online, go on your app, phone or text to check the availability of a product, reserve it and then collect in store that same day. So Argos are stressing the immediate and instant purchase as the main reason for using their click and collect service. Place and pay for your order online by 8pm today (2pm for Collect+ locations), and we’ll deliver it to your chosen shop for you to collect after 2pm tomorrow. If your local store has the item in stock, you can reserve it online to be paid for and collected in store. Your item will be available for collection one hour after your reservation. John Lewis – collection tomorrow if ordered by 8pm. Currys/PC World – collection within one hour. And then there is another consideration that make these services far better than what you’re able to offer via eBay – they allow you to reserve the item and then pay at the time of collection. There are some people out there who prefer to pay in person when they get their order, but that’s not something you can offer via eBay’s new click and collect service. All of this is merely to illustrate, that while initially this seems like it would be a huge boost to sales, unfortunately not as there are just too many flaws in the process that take away many of the benefits to customers. And my simple answer to that question is – yes, you’re absolutely right! As long as there are no obvious downsides to doing so, and if the items you sell are eligible for it, then even if it only benefits some of your customers – you SHOULD offer click and collect. After all, some is still better than none, right? And, surprisingly enough considering it’s a new initiative from eBay, from what I’ve gathered from the feedback and experience of not only my own blog readers but of other eBay sellers online, using the new Click and Collect service is actually fairly easy and straightforward. And there are actually a few other worthwhile benefits to offering click and collect, other than added choice for your customers and I’ll cover these a bit later on. But first thing first, you need to see whether the items you sell and your listings are even eligible for the service. *Sellers may select “Other 24 Hour / Other 48 Hour Courier”, however delivery still needs to be via one of the approved carriers. And then other than this, there are some size and category exclusions. You simply ship items out as normal, except that instead of the delivery address being your buyer’s home, it will be their chosen Argos store. You just have to make sure you include the 6-digit unique identifier code in the delivery address so that your item can be processed and your buyer notified when it’s received. And that’s it! It really is as simple as that. I do want to quickly go over the main couple of fears that my readers have when emailing me asking about this, and then finally give you a couple of extra reasons as to why I think you should offer Click and Collect to your buyers. Returns are processed via My eBay as per normal, and Managed Returns also works in exactly the same way with the item being sent back to you, NOT ARGOS. There really is no difference here in how this works, which is a shame actually as processing returns back through Argos would be ideal (in terms of customer service) as buyers generally prefer a consistent set-up and dropping the item off in-store is easier than arranging a courier or posting via Royal Mail. But then again, that would add another layer of complication so maybe best that eBay have left it like this for now. One worry of many sellers is the procedure if Argos lose one of your items and rightfully so, as you don’t want to be left out of pocket due to the error of a 3rd party. Thankfully, eBay have a pretty clear policy with this – if your item is lost at Argos, then your buyer will be refunded in full (at no cost to you) and you will be protected from neutral or negative feedback as well as any low detailed seller ratings in regards to delivery. If you deliver your item via a normal, non-tracked, service it will still be recorded upon receipt at Argos and tracked from there. So that means you’ll get the added protection of proof of collection, even when not paying for recorded delivery yourself. And then last but not least, although I have to point out that this is just conjecture (as with all best match and Cassini theories) – there is some indication that offering Click and Collect will help your listings in eBay’s search results. Overall my conclusion and recommendation is that, unless you have a very strong reason not to, then you SHOULD offer Click and Collect on any eligible listings. Even if only a small portion of your customers use it, that is still better than none considering there aren’t any real downsides, and more choice and delivery options for your customers can only be a good thing. As always, I would love to hear your thoughts and experiences in the comments section below. Are you offering Click and Collect on your listings? Do you plan to? Or are you a little weary and want to wait and see how it works out for other sellers and based on their results, possibly offer it after Christmas? Whatever your thoughts or if you have any questions, share them below and I’ll answer you personally. sold an item on Ebay…..sent to Argos…..they received the package and informed buyer…..buyer was on holiday and did not pick up item in time…..Argos returned item…or so I am told…..item now missing and I have refunded buyer…..I am now out of pocket….no fault of mine…..have opted out of Argos click and collect……..what protection , if any , does a seller have using this service ? Hi, i sent a parcel to Argos under the click and collect option. Argos received it, Argos sent a text and email to buyer to advise parcel was ready to collect. Buyer didn’t bother to collect and opened a case against me for item not received. I received an email from eBay to say case had been opened and 45 mins later eBay refunded the buyer from my PayPal account. Is that fair? I won’t be using click and collect again. Argos will return your package so you’ll get your item back. Fair or not fair but people can return items for no reason anyway and get a full refund.So that’s how it works I’m afraid. No – people can not “return items for no reason anyway and get a full refund”. SNAD items, yes, but as a private seller, selling used items, the right for people to change their mind in the Consumer Contracts Regulations do not apply, and I do not accept returns. Until I saw this little gotcha I was OK with C&C being automatically added, but opening myself up to the risk of being out of pocket because some dozy buyer just changes his mind or simply doesn’t go and collect the item is a complete show-stopper. This is a business blog though and majority of my readers/followers are business owners, hence we look at things on this blog from a Business account owner perspective in most cases. 1/ Argos have received it ? 2: My customer has collected it? 5) eBay expects the buyer to be given a refund. 6a) If you give a full refund on signed for small parcel, then you lose the £3.95 postage paid to Royal Mail, plus your other costs you don’t pass onto the customer e.g. packaging, PayPal transaction charges etc. 6b) If you give a part refund, then you lose the £4 of commission paid to eBay, your listing fees and potentially other fees to PayPal. The buyer may or may not be able to also give negative feedback. 7) In simple terms if the buyer orders and doesn’t bother to collect, then you lose money either way, probably always a minimum of £3.25 based upon a small parcel plus PayPal fees. In some ways this is no different than the buyer asking for the item to be sent to their work address over the Christmas Holidays (and not collecting) or it going to the Sorting Office (and them not bothering collecting) as is always the case the onus is 100% on the seller and 0% on the buyer who seemingly can never lose out. any opportunity to recover all 3rd party costs, which as a personal seller should be possible. That’s how it works, yes – for everyone. If you want to sell online, you have to accept loses for returns. Have you checked out My Hermes? It won’t be next day delivery but at least much cheaper. Then you can offer My Hermes as free delivery option and offer RM or courier as paid upgrade for next day delivery. Getting a little sick of being out of pocket with this click n collect service, the amount of items being returned as not collected, the buyer gets emails & texts, just today, I have a return started because a buyer has not bothered to pick up, I may and try to part refund as the postage was £7, they paid, I sent & have a signature for delivery to Argos, so I have done my part, if they can not pick it up why should I be out of pocket again. As a seller, I’ve been using the Click and Collect for ages now. We’ve always offered “free” postage to the buyer, and of course we factor the cost of the postage into our BIN price, so using Click and Collect hasn’t made any operational difference to us. We’ve had one item returned as it wasn’t collected- but we get plenty returned from Royal Mail because they haven’t been collected from buyer’s delivery office there either. Anyway, my question today is, when you get the Click and Collect address, there’s the eCP number- is that a one-time useage code? The items I sell come in different sizes so we do a lot of exchanges. This buyer has put the same Argos C&C address as I sent to originally, for me to send his exchange to. Does anyone know if that’s going to work? I can’t find anything helpful on the eBay site as they are really not set up for exchanges- they’d want me to refund the buyer and for him to buy again, but there’s obviously a risk to me that he won’t buy again, or will buy from someone else. If I send to the same collection point using the same eCP I can’t see how Argos’ll know to inform him it’s there waiting for him. You can’t collect without some notification from Argos, can you? People keep saying that this is a free service. That’s not true. I (the seller) have to pay all postage and packaging costs. I still have to go to the post office and pay for it to be sent. BUT in order to qualify for click and collect I have to offer free postage to the customer. So it’s not free at all. The seller is picking up the tab. For small items (packets) I do offer free postage, but for larger items, where this service would be useful. 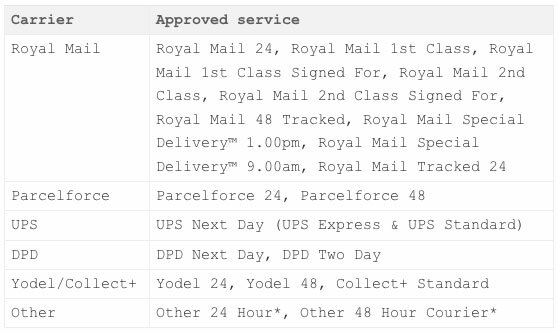 I just cant afford to pay £10 + to post every parcel out. I do have to charge postage on larger items. Everyone knows that FREE SHIPPING doesn’t mean FREE. It’s just worked into item’s price. This applies to any free shipping offers on eBay, Amazon, websites etc. There’s no such a thing as free shipping (apart from collection in person which for sellers doesn’t cost anything). When i go to set up my Click and Collect it says “Unfortunately your account isn’t eligible for Click & Collect at this time ” i do not know why? has anyone came cross this? Well, because of the way Ebay curently operates in letting sellers from all over the globe list their location as within the UK on their listings, so far, using click and collect assures me the item ACTUALLY IS in the UK. I do not buy anything from ebay other than click and collect with a maximum of 5 days delivery. Us buyers have to be savvy on ebay if their corrupt system does not allow us to ACTUALLY filter results correctly. Why do they not simply use the location on the sellers feedback page, not their corrupt listings page? Well, because many sellers nowadays have UK based warehouses or simply use UK based FFH for orders within UK. So it only makes sense they can show item location as UK. Possibly true, BUT, how does one really know this? I will NOT take the risk, leave that to the other Ebay members to moan about after buying and not recieving, waiting weeks for items or having to pay return postage for damaged/malfunctioning goods. We all have a choice, I want to buy from a registered UK seller, not a foreign FFH thanks. Ok. Smaller item = Footjoy Golf shoes. Seven of the first ten Buy It Now items all add a cost for postage. Joanne, I’m with you all the way on this and I’m relieved that at last I’ve found such a simple question raised. For the seller it is surely only worth using if you are offering Free Postage anyway, otherwise the seller is not covering their postage and packing costs as the inclusion of a P&P charge would do. I really can’t agree with Andrew’s dismissive statement ” …..most sellers on eBay nowadays offer free shipping to customers”. Not sure what ” eBay’s first page results” are. Can you explain or illustrate for me ? I can see the advantage of Click & Collect for sellers and buyers of large items that otherwise cannot be posted through a letterbox but for my interest in postage stamps and coins I cannot see any benefit only a costly alternative. By First Page Results I mean – if you search for any product on eBay – listings that come up on first page of search results (so in top of everyone else). Ok. I presume you are referring to Buy It Now items rather than Auction items. 10. £95.00 + FREE POSTAGE. ……………..Hardly “majority of sellers offer free shipping” ? That is a rather large item David. For smaller items you’ll see more and more FREE P&P listings. And yes, I’m referring to BIN listings for NEW items only. I’m with Andrew on this one, the fact that postage is included or charged separate is irrelevant. You are basically sending the item to Argos or their home address and the cost to the buyer or seller is the same either way. The service that Argos is offering as an added convenience is free to use. If you post an item out it is going to cost you the same in the UK whether you send it to Argos or their home address. You can still use the service, just add the cost of the postage to the item you are selling. There is one significant difference and that is if the buyer does not pick up form Argos. the buyer gets refunded in full, both Ebay and the seller lose out as Ebay pays the return costs and you have already paid the outgoing costs. Hopefully this will get cleaned up soon as I believe buyers who don’t collect should be penalised and repeat offenders should be barred from using such a service. I’ve had my HSBC card scammed and used for eBay purchases for delivery at an Argos in Essex- I live 200 miles away! I guess collection @ Argos is very handy for credit card scammers as this way PayPal/eBay never really finds out their real address. I’m confused about this service, click and collect isn’t free if the seller has to pay shipping costs to the Argos store. shipping would normally be charged to the buyer but if it is advertised as free then the seller is out of pocket as they are paying the postage. I don’t see the benefits of this service or have I got it completely wrong? As you have noticed, most sellers on eBay nowadays offer free shipping to customers – of course nothing is free and they simply put the shipping price in item’s final price. Benefit of Click & Collect is that many people may prefer this kind of “collection” method – rather than waiting for a postman/going to post office to collect their packages. Yes that’s the main benefit ! for example , i live in Croydon and i have two jobs , and i am kind of never a home ( just in the evening) , so there is basically no one home to receive my items ! And the Argos store on church street , is in my way to my other job , i’m just passing , go in , collect my things and go !! I mostly buy laptops and parts , so it’s perfect for my needs !!!! Hi Andrew,just used click & collect for an item,delivered to Argos which according to courier tracking,arrived on 25th November. Ebay wont give me a collection number until after 2nd December, even though it is there, ready for collection. Wish I had it delivered to my home address. Wont be using this service again. It is definitely slower, yes as another middle man (Argos) is involved. I sold an item for £2.49 the buyer used click and collect at argos then didn’t collect it. Its being returned with a tracking ref. Who pays for that? do royal mail just cover the cost? I know it says ebay will automatically refund the buyer with in 6 days. Thanks great article btw. So it is free or not? By free I meant there are no additional costs involved. Seller pays shipping anyway – whatever it’s directly to customer or Argos store. It’s same cost/expense. I would like to know what happens if for some reason the item a seller ships to Argos somehow goes missing in the system before it is collected. eBay states that the seller should ship as normal to the shipping address that they supply, but presumably this means that for higher value items the owness is still on the seller to make sure that the package is still insured to the selling value. Since the package is not being delivered direct to the customer there can be no valid recipient signature, even using the allowed shipping methods, so do Argos actually sign for the packages and are their signatures considered valid by the eBay seller program. I’d also like to know how the eBay seller protection program deals with any item which goes missing within Argos’ system once the sellers package gets into it. Do eBay take responsibility, or do they pass the buck onto Argos. There are many documented cases of problems with the eBay international shipping program where customers have faced being passed backward and forward between ebay and the shippers Pitney Bowes with no-one apparently wishing to take responsibility. I’d certainly like to know that both the seller and the buyer would be adequately protected before shipping anything of material value through this system. These are all very good and valid questions which you should direct to eBay – get their reply. Hi does the seller pay for the parcel to be sent to Argos or is this free. Also, if the customer wants home delivery rather than Argos is there an option to state postage cost. Yes, seller covers shipping costs to Argos store. Yes, of course you can also offer standard/paid delivery option along with Argos in your listings. Sounds like the seller is worse off using Click and collect? If I sell something for £50 and charge £5 p&p then I get £55 from the buyer, keep £50 for the item and pay £5 to the Post Office or whoever. If I offer C&C then that’s free to the buyer, I get £50 but have to spend £5 to post it to Argos hence only make £45. Is that right? Seems a disincentive if it is. Yes, your math is correct. It’s all about added value to buyer – as many people may prefer pick up @ Argos instead of usual RM/courier. You should probably ask eBay about this. I’d say that there’s no problem in delivering that package to Argos store your customers want to collect from. But of course you won’t be able to do this IF customer’s selected Argos store is different one. Great website with very helpful info. Just one question about the eBay / Argos Click and Collect. Do Argos get to see the details of the goods you’re selling, or is it simply a case that they are acting as a handover point for “a package”? I ask this for two reasons – one is that Argos could obtain commercial information in this way – the other is that many eBay sellers are marketing “personal” items that buyers would wish to collect without the contents being known to the Argos staff handing them over! I don’t think Argos gets any info on orders or items that are in these packages, no. They just act like as handover point as you say, much like My Hermes drop off/collect locations. When buyer pays (and selects Click & Collect), you’ll print the shipping address from your eBay account, where unique number will be included. And buyer will receive collection number too. So not much extra work you need to do really. I have used click and collect as a customer. There is a problem with it: items are returned automatically if not picked up within 4 or 5 days. But Argos is only open 9 to 5:30, so you can’t pick up after work. I was on a course last week, then away from friday evening to monday evening. Tuesday I had appointments all day, and by wednesday my purchase had been automatically returned. So as a seller, you are going to see returns that neither you nor your customer wanted to happen! There needs to be a way for the customer to ask for the item to be kept at Argos a little longer. (seven days more makes sense). Or Argos needs to open early/late. Thanks for sharing this with us Philip! Any idea what I am doing wrong? Do I have to put the size of the product somewhere for it to accept it? I am baffled. Not sure if the link above will post it’s just a screenshot of my postage. P.S I will be buying your DVD (EAB) on christmas eve (payday of all days!) I am just wondering is it available instantly or does it come as a physical copy? First thing you should do is probably double check in your settings whatever Click & Collect is enabled for your account at all? P.S. EAB course is hosted online so you get INSTANT access right upon payment. As for Site Preferences, I can’t see anything to do with Click & Collect in there, I read that’s where you opt out of it so I did look there yesterday but couldn’t see anything, just double checked and nothing is there. Not sure what to do now, has it been moved at all or am I just unable to offer it due to being a new account? Your best bet Ryan probably is simply to contact eBay and ask why is this happening (or not to be precise). Hi Andrew, really interesting read. Going to add Click & Collect as it can’t do any harm. My only point of confusion is around the delivery address to the Argos stores. Will this address show up instead of the Paypal Seller Protection address within Paypal itself as this is where I send my parcels (having been advised in the past that it’s better to send to the Paypal address rather than Ebay address given)? Address in eBay, yes, not in PayPal. Thanks for the reply Andrew. That’s a major change to how I despatch items (having logged into Paypal and taken addresses from there for the past 3 years). You used to get differing addresses sometimes between Paypal and Ebay and to maintain seller protection the recommendation tended to be to use the Paypal address. So just to be 100% clear you’re saying to take ALL addresses from within Ebay itself (not from within Paypal, and not from the Paypal emails with the despatch addresses on)? This is at least how I’ve been doing it, yes. I export all eBay orders into our order processing system and use eBay addresses. This is what eBay recommends too. so whats the cost of click and collect at argos, im sure argos arent doing this for free and will want a cut of the profit…which reduces profit margins further…. Click & Collect is completely free for buyers and sellers. I’m sure eBay have a specific agreement with Argos in place where they pay fixed amount for each order. Also, this is great exposure and extra traffic for Argos too, so it’s a win win situation for both companies. Maybe Argos do it even for free, taking into account extra people they get in their stores. You can’t drop packages at your local Argos, as a seller.